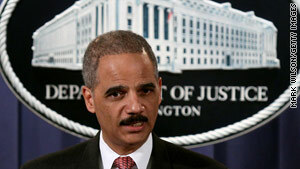 Attorney General Eric Holder said Arizona's new immigration law could be "subject to potential abuse." Washington (CNN) -- A federal court challenge to a new Arizona law aimed at curbing illegal immigration isn't out of the question, Attorney General Eric Holder said Tuesday. Holder said that the Justice Department was working with the Department of Homeland Security to "decide exactly how we are going to react to it." "We are considering all possibilities, including the possibility of a court challenge," Holder told reporters during questions at a news conference, at which he had announced a settlement with pharmaceutical company AstraZeneca over its marketing of an anti-psychotic drug. "I think that [Arizona's] law is an unfortunate one," he said. "I think that it is, I fear, subject to potential abuse. And I'm very concerned about the wedge that it could draw between communities that law enforcement is supposed to serve and those of us in law enforcement. " Homeland Security Secretary Janet Napolitano, who served as Arizona's governor until she took the position with the Obama administration, told a Senate panel Tuesday that she has "deep concerns" with the law. Napolitano said she fears it would siphon away resources that would otherwise be used to pursue individuals who commit major crimes while in the country illegally. "I think these kinds of laws are not value-added to law enforcement," she told the Senate Judiciary Committee. "There's a reason most law enforcement groups ... oppose them." They put an "undue barrier" between victims of crime and law enforcement officials, she said. Napolitano, who served as Arizona's governor before joining President Obama's Cabinet, refused to offer an opinion on the constitutionality of the law. The new law requires Arizona police to determine whether people are in the United States legally if there is a reason to suspect they aren't. Arizona Gov. Jan Brewer, a Republican, signed the controversial legislation into law Friday. Supporters say it is needed to control illegal immigration. Last week, Obama called the legislation "misguided" and said the federal government must act on the immigration issue. Napolitano told the Judiciary Committee members that the "passage of laws like [Arizona's] at the state level indicate the need to move forward with comprehensive immigration reform." "Our borders are broken ... [and] there's a war going on" with drug cartels in Mexico that is spilling over into the United States, he argued. "Good people are so afraid of an out-of-control border that they had to resort to a law [in Arizona] that I think is unconstitutional," he said. The federal government has to prove "that we can secure our borders" before Congress can pass an immigration reform bill. Over the weekend, Graham withdrew his support for what had been a bipartisan plan to pass climate change legislation because, he claimed, Democrats were trying to ram through a polarizing immigration reform bill. Some political observers have said Senate Majority Leader Harry Reid, D-Nevada, is trying to push a reform plan in order to boost his standing among Hispanic voters and bolster his re-election prospects in November. House Majority Leader Steny Hoyer, D-Maryland, acknowledged Tuesday that congressional Democrats are divided over how to proceed with an immigration reform bill. He also said House members are expecting the Senate to take the lead in crafting a proposal. "In part, of course, what the people of Arizona are saying is that the feds haven't done their job. I think they're right," he said. But Hoyer criticized the new state law, arguing that it is "very inconsistent with past practices in America. ... We don't go around asking people for I.D. cards." He said it is "very difficult to see how that's going to be carried out in a way that's consistent with the civil liberties of citizens." Napolitano declined to provide a direct answer when asked whether the Arizona law could negatively impact race relations. But "if this law goes into effect," she warned, "there are a lot of questions about what the real impact on the street will be." CNN's Alan Silverleib, Deirdre Walsh and Alexander Mooney contributed to this report.